How i start has a blogger and the biggest mistakes i made - Hallo sahabat Information About Blogger, Pada Artikel yang anda baca kali ini dengan judul How i start has a blogger and the biggest mistakes i made, kami telah mempersiapkan artikel ini dengan baik untuk anda baca dan ambil informasi didalamnya. mudah-mudahan isi postingan Artikel Blogger tips, yang kami tulis ini dapat anda pahami. baiklah, selamat membaca. 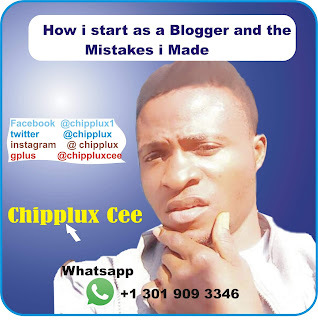 My full names are Chigozie felix Onyechi but am popular known as 'Chipplux Cee' the story begins!!! beginning to blog since October 2nd 2012 when a friend of my is blogging on music and I find it so interesting and fun when he told me how much is collecting from upcoming Artist for music promo and how Google is going to pay him soon , because am a music producer and singer i decided to create my own blog on my own. I didn’t ask him how and which step he take and how he create his blog, i just went ahead to create a mobile website with the help of Google, I search on how to create a website with mobile phone because I don’t have PC and I fund wapka.mobi. Wapka is a Free mobile site builder for Content Management, with lot of features that allow users to create website and wapsite etc and I create a lot of site on wapka till I finally design a beautiful mobile site. February 22nd2013 i bought a Domain to make it look more professional before it was http://termsmusic.wapka.mobi/index.xhtml after buying .com domain I rename termsmusic.wapka.mobi to wapkitz.com because all I want is to blog music and my music and also make money too online. is bcus of copy write content, adult content, site on construction and site like wapka is known as virus to Google bot because of the features the site builder carries and the site don't have custom TLC, SSL verified security for it users unless you purchases it, which cost so much money. You can use wapka for forum update, music upload, blog post and even video streaming site, you can even create a phishing site and steel people their personal info or hack people bank credit card, facebook, gmail, twitter etc. I ask Google how to make money with inforlinks, admavin, buzzcity or uc union; before I find out that you most have a lot of impression on your pages and more click on the advert, the ads network display before making money . I leave the site and look for work so I can earn money and support the site by buying adverts from facebook and Google to see if I can make money, getting tomany visitors and click in my site. Because am a person that never give up easily until I achieve my goal and what takes me into blogging is to make money to support my family and my education and carrier. To get work in my Country Nigeria is had even the graduate find it difficult to find job talkless of un graduate. unless man power jobs, farming or you go begging in the street. Same year 2013 i got a man power job with Cowbel in Onitsha east of Nigeria then later leave the work and join Paxson Ng but still the same Man power job. Not that job only I work in the recording studio @ angelrecords in the night after working in the day bcus that my passion to sing and produce music but we don't usual work all the time. I search on the platform which she use and create her blog and what gives her that much money that she even built a mansion in her fathers house and live a luxurious life. It was Google blogger and adsence and I didn’t waste any time I took my self to blogger.com and create my first blog name Musicpluzz.blogspot.com on February 2nd and I chose template I find it so easy to create my blog and I started copying content from Naijaloaded and linda ikeji blog and my first blog post on musicpluzz blog is wande cool and Olamide at war on 6th of feb 2014 I copy from naijaloaded check the pic you will see it below or search google you will find the date. I blog both music and news mixed together in shot I mixed to many Niche altogether and finally I summit my blog to Google adsence and google tells me insufficient content and I keep on blogging until I published about 70 post and I resubmit my blog but this time Google disapprove me . I almost give up in blogging before my mom advice me that I should not give up in any good thing you are doing unless you are not doing the right thing. i give my self second chance to try again. And I beg my mum to raise money so I can buy laptop and support my blogging which she did and I enjoy more on pc. I decided to create my second blog name 9japotal.blogspot.com on 22nd of September 2014 and I created my first post Synagogue building collapse, I drank my urine to survive South African woman shares her Experience. I did a free job for him and he decided to help me through that way.by buying .com domain from Godaddy. And I blog up to 200 post then I submit my blog to Google adsence and my blog is disapproved almost 4times for copying content and posting adult content online and I ask myself why is my blog is always disapprove by Google adsence? At that moment I give up blogging because the reason am blogging is to make money not to waste time on the internet copying content and posting without making money. I search online for other best adsnetwork just like adsence and I found out propeller ads, jumia affiliate program, konga, adsmavin, etc. when some one buy goods with a link from my blog and I decided to check my link if I have made any sales to God be the glory I see N45k and I check what that person buys that gives me such money on 5th of October 2015 the person buy random goods of about N400k and I bought myself nice phone from my link and keep on blogging. Until that same friend who buy dot com domain invite me for a business trip in Canada after i have explain my situation to him.....which he sponsored my trip. I now decided to create my own business company on May 2018 Truelinkz Internet Global Services. where I can share only what I have learn so far and what will be in help to so many people online even bloggers and those wanting to make money online. and those that have made money online too. i decided to be in help when it comes for web or internet issues. Now I have 2 blog with Google adsence not only that but also working with blue host ‘web hosting company I receive $25 for each domain or web hosting anyone reg through my blog. i make money promoting goods and rendering online services. i make money designing website and graphic design. With my business skills now I can be called a business entrepreneur, a web designer, Best friend to Google, SEO Tips, Keyword research master, Online writer, blog tutor and a publisher. · I teach and start up online business for so many people. · I write my content and article without copying. · I have my own online store like Jumia which am going to Lunched very soon. Knowledge is the key to success, because you can’t do what, someone is doing to make money if you don’t have the knowledge of it. And also having the knowledge, wont make you succeed but applying different style and method to it. And the last thing is knowing God. I blog like others that makes millions not knowing how and what to avoid. I just blog without categories by mixing all kind of post in 1 blog. I blog with less traffic but instead of increasing my blog visitors I end up placing adverts that chase my visitors to other site. I don’t have time to create my own post and my niche. I blog without having knowledge of it. I end of making the same mistake all the time. I blog without having the passion. I take blogging has business but I don’t make money. I end up applying my blog to scam site not reviewing their stats, how long they exist and how much have they pay publishers so far, where they reside and what people are saying about them. I jump into blogging just to make money without giving it my full time. I have many opportunity has a blogger to be famous but end up messing everything. The biggest mistake I make is blogging anything I see on the web without telling people what my blog is all about. Another big mistake is copying someone hard work to make money with it without knowing how to. If you find yourself reading this post and you make same mistake don’t give up you still have the time to correct some mistake and move on and if you want to blog to make money for the first time please read careful and avoid some mistake above. Thanks for reading and May God increase your understanding and gives us more knowledge in making money online Amen. Thank you for visiting the article How i start has a blogger and the biggest mistakes i made hopefully always provide useful information, see you in another article. 0 Response to "How i start has a blogger and the biggest mistakes i made"